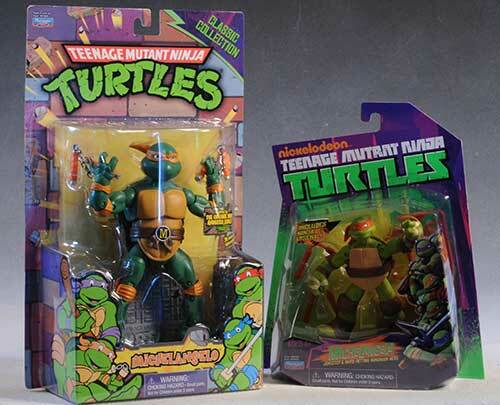 Since Playmates Toys first started the Teenage Mutant Ninja Turtles line in 1987, there have been thousands of action figures. While other companies are lucky to get 3, 4 or even 5 series of any one license, Playmates has kept the figures on the pegs almost continuously for 25 years. With the release of the new Nickelodeon cartoon, Playmates has made another push for new figures, vehicles and play sets based on the new designs. These figures are fairly small, coming in at about 4" tall. I'll be reviewing Mike from that series tonight, and you can see him directly to the right. 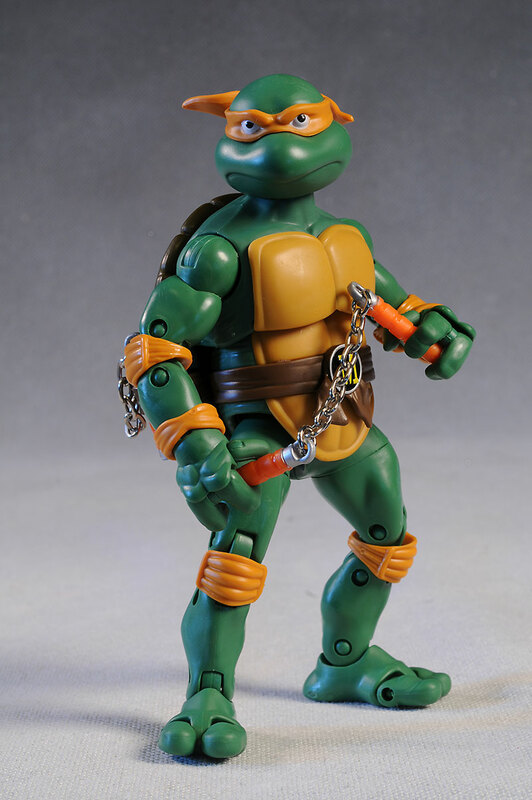 Along with these new designs, Playmates is releasing a series of larger figures (6" scale) called 'classics', obviously based on the original art. I've only seen these at Toys R Us, and tonight I'm covering Mike from that set as well. The very first large photo at the top of the review is of this figure. The classics run $17 each, while the smaller new figures run $9. While I've only seen the classics at TRU, you can find the others at just about any major retailer. The classic figure has a nice retro logo, as well as classic graphics. Neither is collector friendly of course, but they are sturdy and should hold up to peg and storage wear. The new line has a sharper, more angular design to the package, but if I had to choose I'd pick the classic. There's just something about that old school look that works with this license no matter what year is on the calendar. 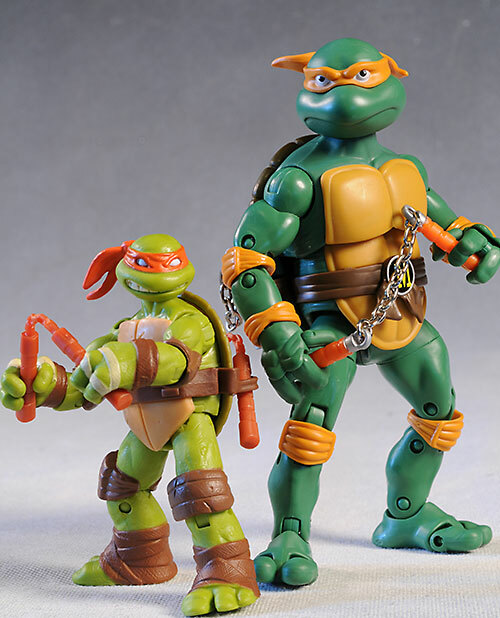 These are two very different turtles, but I like both styles. 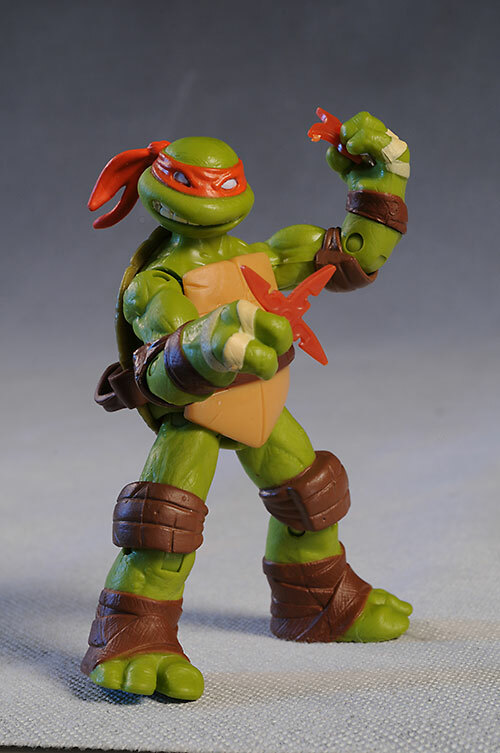 My preference is really with the classic, but modern kids may find the skinnier arms and legs a bit odd looking. Neither figure has a lot of detail, but the classic has even less texturing and definition. The new version is shorter, obviously (the classic is just over 6", the new is just over 4"), which was probably a marketing move to ensure parents would realize that the figures really are distinctly different. He also has more detailing, especially on the wraps and pads. Neither figure has a ton of detail, and many of the colors are just what the plastic has been cast in. There's a few details though, like the eyes, and there's enough slop and weak edge lines to pull the score down a bit. The new design lacks pupils - it's a little creepy. The classic figure has then, but the whites are pretty sloppy, with plenty of paint getting outside the edge. It's also a personal preference and not something that effects the score, but I have to say I prefer the classic green to the more puke colored new versions. The articulation is surprisingly good on both of these figures, and the joint count (and usefulness) is much better than almost every other current mass market line out there. Let's start with the new figure. He has a true ball jointed neck, and it has a tremendous range of movement. It's my favorite joint, and they've done it exactly right. He has pin/disc ball shoulders, elbows, hips, and knees, which means all these joints can move forward and back AND turn 360 degrees. There's no ankle articulation due to the design, but it's a minor issue at best. There are cut wrists, however. The classic version goes farther across the board. He has the same ball jointed neck, and once again it's just about perfect. He also has pin/disc shoulders, hips, and ankles, but he goes even better with double pin knees and elbows, and there's cut biceps and thighs to increase the mobility of the legs. There's a mid chest joint as well, and the three fingers and two toes are all individually articulated. That's pretty impressive! So why not fours? Each has one issue that holds them back from getting at least a half star higher in this category. For the new Mike, it's a stuck hip joint that just won't free up. I know it should, but I haven't been able to break it free. Hopefully that's a figure specific issue, and not a bigger problem across the run. On the classic Mike, it's a bigger problem. All the leg joints are very loose, making it tough to take advantage of all that great articulation. Again, I'm hoping it's not across the line, but loose joints are always a major annoyance when they show up. 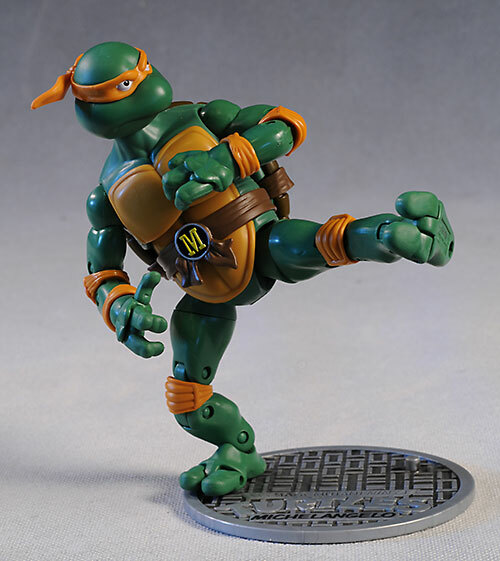 The classic figure only comes with three accessories - his two chuks, and a display base designed to look like a sewer manhole cover. The base works well, and has posts for either one or both feet. 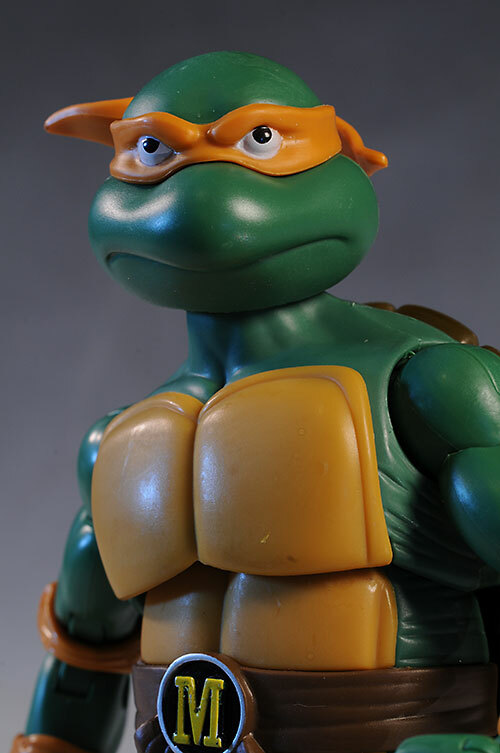 The sculpt and paint job are good, and it does allow you to pose Mike in some more dramatic ways than you could pull off without it. 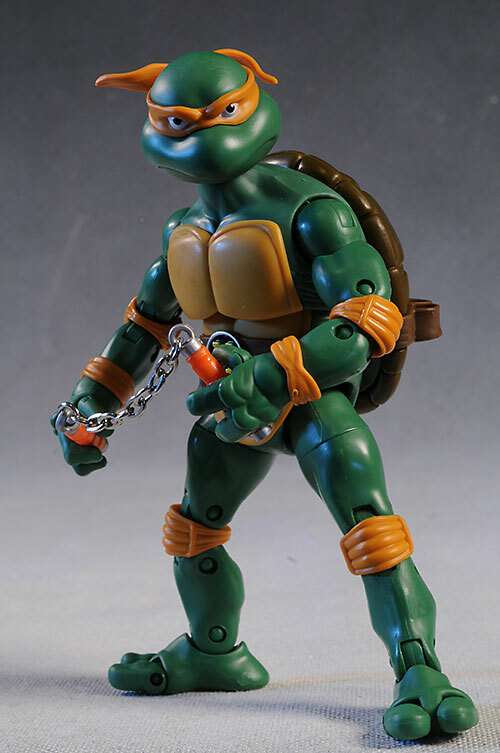 His weapons are well sculpted and include real metal chains, not cheap plastic imitations. They look good, although I couldn't get him to hold one under his arm. 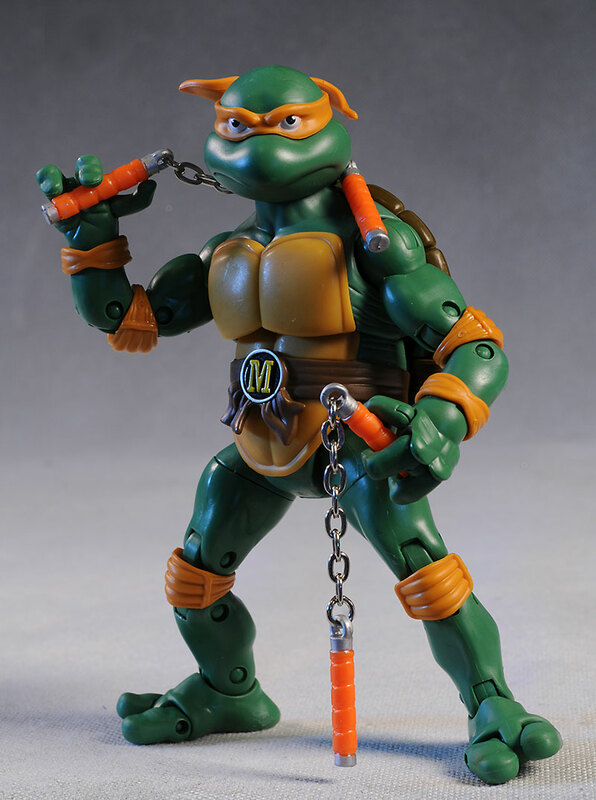 The newly designed Mike also comes with two chuks, but these have plastic chains. There's also a scythe weapon on a chain, as well as four different stars - two of one size and two of another. That's a nice group of weapons, but they are all in a single color, and some are still attached to the sprue. Both of these are cost saving measures, which relates to a better score in the Value section. 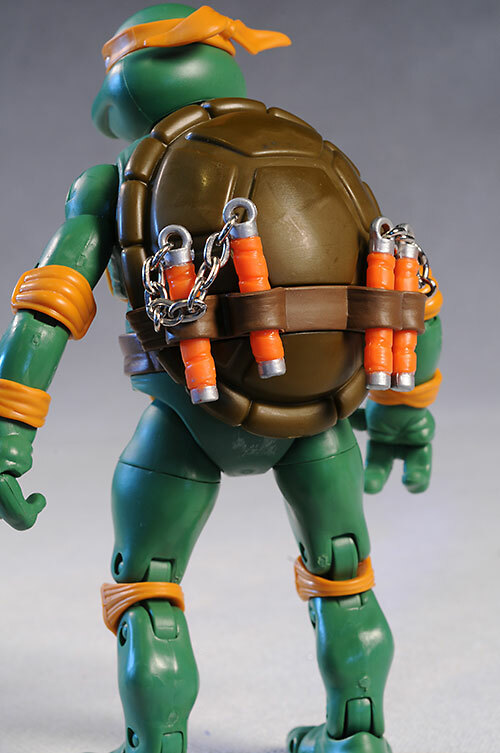 The back of the shell on both figures have loops for the chuks. They work perfectly with the classic version, but with the new version, there's some issue with the chains. If you squeeze them together to fit one in one loop and you'll end up with a stress break. Instead, stick one handle from each in either loop. These aren't super detailed figures but they are great toys, showing that cool action figures with well done articulation and accessories are still possible. 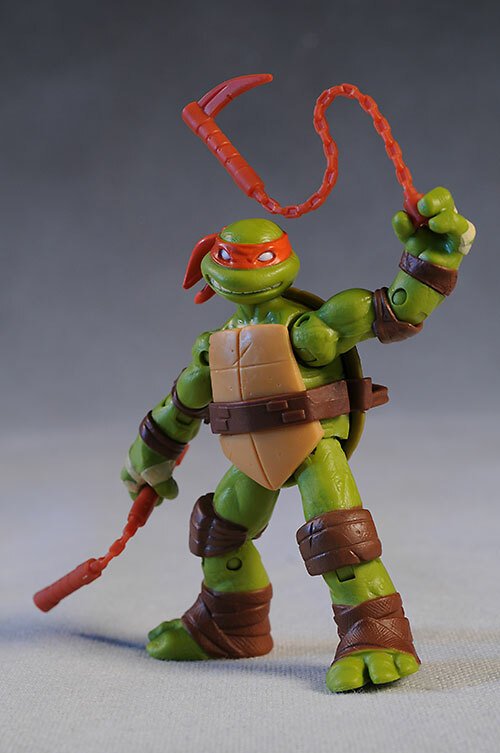 Too many action figures on the pegs right now have no decent accessories, crappy articulation, and a higher price tag. 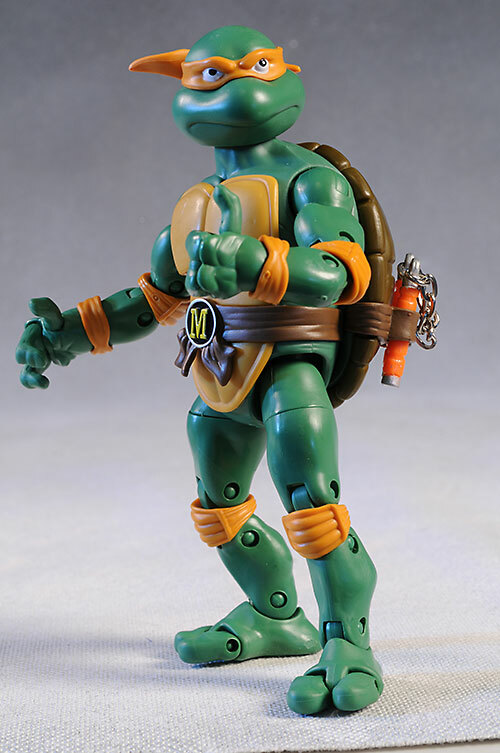 At $17, the classic is running at the average for most 6 - 8" figures. With the metal chains and high level of articulation, it's a better value than most at that price, but it's still not cheap. The new figure is smaller of course, but has good articulation and accessories as well, and is only $9. That's a rare price point, even for small 3 3/4" figures from other companies. 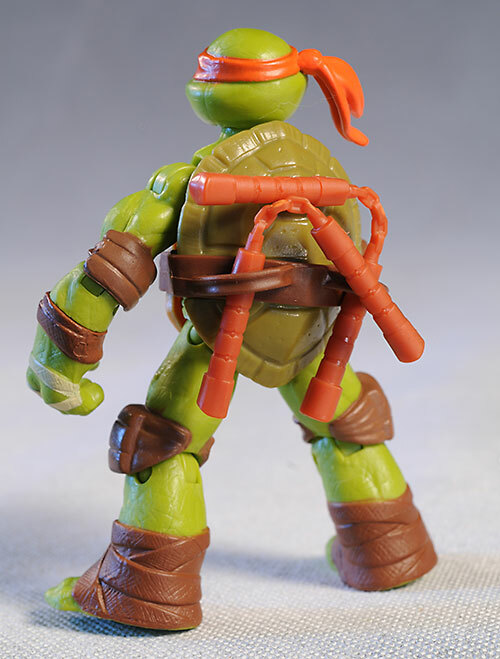 I think that Turtles fans should be happy - they're getting another nice set of figures, and Playmates is paying a lot of attention to the articulation and poseablity of these. 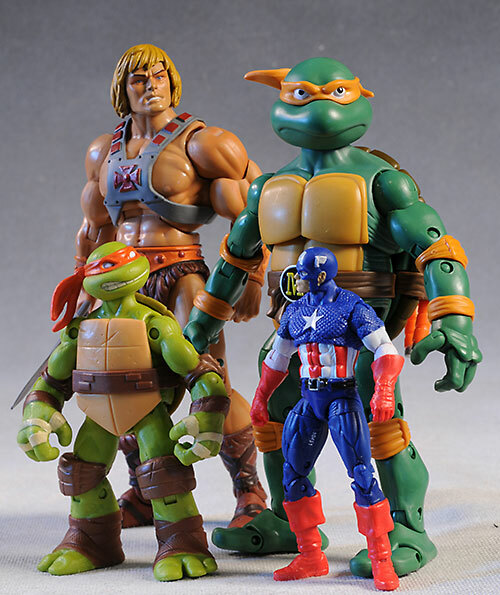 The classics are well worth picking up, even at the higher price point, and had Mike's legs been a little tighter, he might have even been a four star figure. The new designs aren't quite as good, especially the skin color. 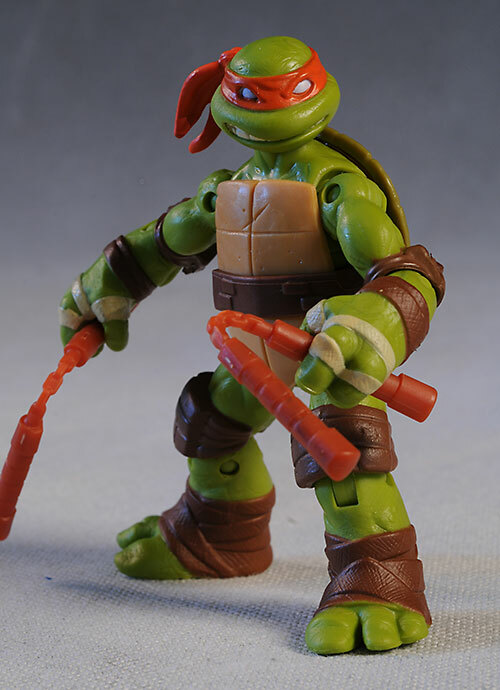 But again Playmates paid particular attention to the accessories and articulation, making them great toys first. They've certainly had trouble with some other lines in recent years, but they still know how to give the Turtles the love they deserve. I've only seen the classics at Toys R Us, but there's nothing on them about being an exclusive. The regular figures for the new show, along with the vehicles and playsets, are available at just about every retailer. You can search ebay for a deal as well. 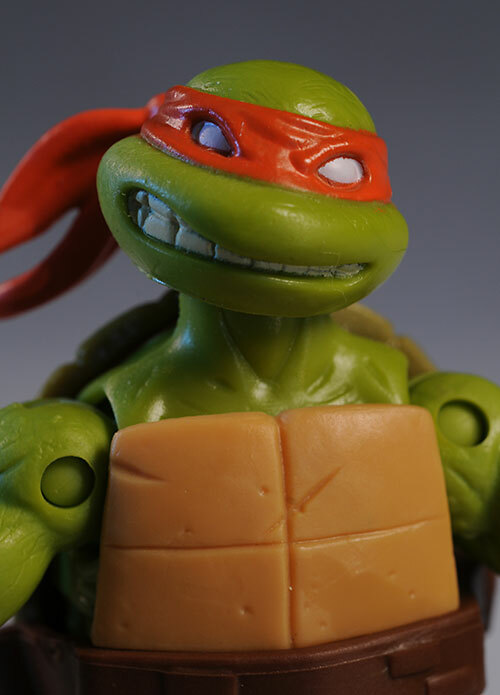 Other TMNT reviews include the terrific series by NECA, Playmates movie versions, and more of the early 2000 toys.